1. Place all the ingredients numbered 1 in a pressure cooker. Pressure cook for 2 whistles. Open the pressure cooker after 15 minutes. Add hot water and cook for a few minutes, if the dal is very thick. 2. Heat 1 tbsp oil in a small pan. Splutter mustard seeds and fry dry red chilies and curry leaves. Pour over the dal. Garnish with chopped cilantro. Serve this delicious raw mango dal with rice and a veggie stir-fry. Delicious and mouthwatering dal. Very tangy and tasty as well. Hi Maya, once again, hello from San Antonio-you may remember I messaged you before about your cousin being my Dad’s PhD student. Thanks for maintaining such a wonderful blog-this is my go-to resource when I am stuck and don’t know what to cook, whether it be for guests or my day to day cooking. 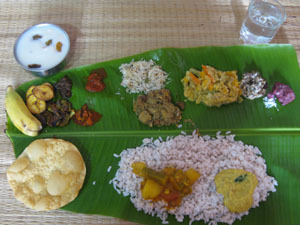 One request-I love south Indian rice dishes such as tomato rice. Since you seem to be on an Andhra kick, is there any way we could get an authentic tomato rice recipe? Mango rice and lime rice are old favorites too-so good to pack for lunches etc.